Fill a small glass or jar with vinegar - any will work, but it might be best to use white vinegar as it is easier to see the egg. Put an egg in, and make sure that the egg is covered with the vinegar. Leave the egg for 24 hours. Then have a look at the egg. Is it at all different? You should find that the shell bubbles slowly in the vinegar. 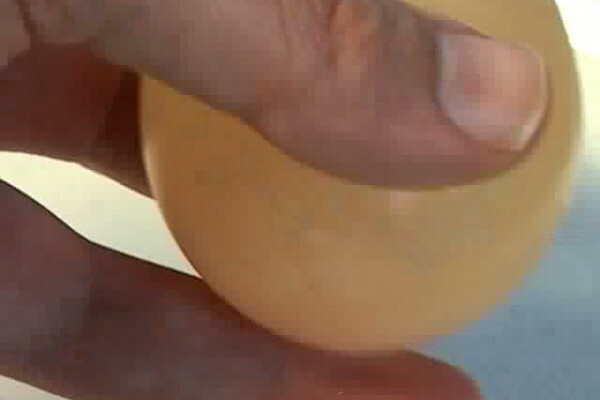 After about 24 hours, there will be no shell left, and the egg will become flexible and soft. The eggshell is made of calcium carbonate (CaCO3) - the same mineral as limestone. If you react a carbonate with an acid, you are left with a soluble salt, carbon-dioxide, and water. The shell slowly dissolves, producing bubbles of carbon-dioxide. So the only thing left holding the shell together is the membrane which keeps the liquid in the egg, which is flexible and stretchy, so the egg is flexible and squashy.